Here is a tip to put your guests in a festive mood...Hire 'live' music! I love arriving at a venue before the party begins so that I can greet the guests with my piano music when they arrive. 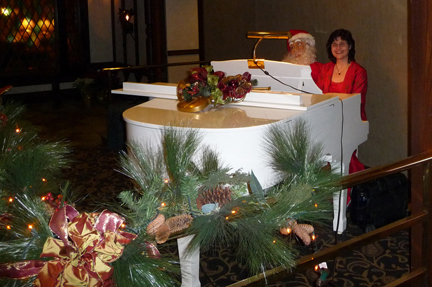 Live piano music adds a sparkle to Holiday and Christmas parties! At the start of a party live music is a great ice breaker and brings smiles to the faces of the guests. As guests arrive, get their beverage, and settle into conversation, I keep my piano music light and easy going. The music creates a pleasant atmosphere without being distracting. Guests sometimes stop by the piano to request a favorite song or even want to sing along. Children seem especially attracted to songs with a lively beat...for their dancing feet! If the event is a cocktail reception, upbeat jazzy holiday tunes create the perfect musical setting. If a sit down dinner is part of the event, I play quiet elegant holiday piano music while the guests are dining. Guests often love to gather around the piano to sing their favorite Christmas carols. I have my songbooks ready to hand out for just that occasion! Holiday sing along at the piano. Activities that involve music are a great form of entertainment. 'The Twelve Days of Christmas'. If some of the guests have a dramatic flair, selecting 12 people to act out 'The Twelve Days of Christmas' while the rest of the guests sing the song can really get the action going. Providing appropriate props can add to the fun or you can encourage your 12 participants to use their imagination in acting out their part of the song. You might be surprised by the crazy and creative ideas they come up with! 'Frosty the Snowman' . This activity involves TP (yes, toilet paper...clean, please!). This can be done as several teams or as one activity. Each team selects one participant that will be their 'Frosty'. When the song begins, each team will 'decorate' their Frosty with toilet paper and whatever items they can find to make their 'Frosty' look the most clever or original. The 'decorating' ends when the music stops. Guests vote on the winner. Have a prize for the team that wins....a bag of candy is an easy prize. Musical Dice Game. Ask each guest to bring an inexpensive wrapped gift. Everyone sits in a circle, with all the wrapped presents on the floor in the middle. Players take turns rolling two dice on a pie plate. If your group is large you can use several pie plates each with a pair of dice. Start the plates going different directions. Have your musician play some lively holiday music. If a player rolls a double, that person gets to pick a gift from the middle. The dice continue around the circle until all the gifts have been taken. At this time everyone that has a gift opens it. Going around the circle, those with gifts hold up the gift and explain what it is. They set their gift on the floor in front of them so everyone can see what they have. Set the timer to the length of time you want (10-15 minutes is decent). Ask your musician play some lively holiday music until the timer goes off. Send the dice around the circle as long as the music is playing. If a player rolls a double, he gets to steal a gift. Keep the dice going until timer goes off and the music stops. Anyone with more than one gift keeps only one gift and puts the rest in the middle. Those without a gift move their chairs in to make a smaller circle and continue the dice rolling (with music!) until each of them has won a gift. Christmas caroling around the piano. Planning a 'Winter Party' is a good alternative if you wish to avoid religious connotations of a Christmas Party. Some clients, especially corporate clients, are sensitive about hosting a holiday party that reflects religious views. In order to make all guests feel included and comfortable, the client may want to keep the music and party plans secular in nature. Hosting a party with a 'Winter' theme is a good approach. I always ask the event planner to let me know what music I am allowed to play. Some clients ask me to only play secular holiday music and avoid Christmas carols. A few clients have even asked me to avoid songs that reference St. Nick. Even though this limits my repertoire, I am respectful of such requests. If the event is longer than an hour, I will ask if I can include some non holiday music. The enthusiasm and joyous spirit of the guests makes Christmas parties great fun to play for! You can listen to several samples of my holiday piano music on my 'Listen' page. 'Tis the Season to Make Music! Have you enjoyed some fun holiday party activities that involve music? Share your ideas in the comment box below. This bright shiny red CTS was decked out and ready to make someone happy this Christmas! Key Cadillac wowed their guests with the showcase of their 2014 CTS Sedan. What better idea than to hire a holiday pianist! My piano had the perfect spot nestled beside the poinsettia. I took a break from playing holiday music to check out the CTS and 'feel' the luxury! Holiday pianist meets CTS Coupe.